Dodge Conquest: Because You Can't Repeat the Word TURBO Too Many Times! What came after the Malaise Era? The Turbo Era, of course! In 1986, when your car had a turbocharger under the hood, you wanted the world to know it. This was the philosophy behind the Starion/Conquest. I found this battered but mostly complete Conquest at a local self-service junkyard last weekend. I couldn't find a Members Only jacket inside it, but otherwise it was a total 80s flashback inducer. I was ready to call Adnan Khashoggi on my 20-pound car phone and arrange for some quad-barreled 57mm "relief supplies" to be shipped to the Contras! 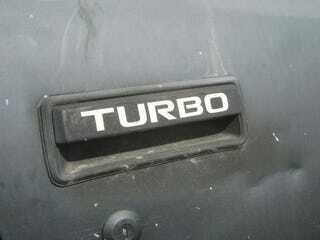 Yeah, even the seat belts boast special TURBO badging! Did I take one home for my collection of silly car parts? What do you think?